New Era Combination S 240 Tablets - SPECIAL OFFER! <b>** </b> <font color="#FF0000""><b>FURTHER SAVINGS ON BULK PURCHASES</b></font alt="test"> <b>** </b> <br> <br> <b>-</b> <b>FOR A QUICK REFERENCE</b> ON THE MEANINGS OF THE SALTS, VISIT OUR <b>BLOG</b> - <a href ="https://neweratissuesalts.wordpress.com/2015/06/09/new-era-individual-and-combination-salts-buy-now/""><b>CLICK HERE.</b></a"></a><br> <b>-</b> <b>OR CONSULT</b> THE BIOCHEMICAL HANDBOOK ON TISSUE SALT USES - <a href ="biochemichandbook.pdf" target="_blank""><b>CLICK HERE.</b></a"></a><br> <br> <b>How to take:</b><br> <b>Adults:</b> Dissolve 4 to 8 tablets on or under the tongue 3 times per day. <br> <b>Children:</b> Up to 12yrs half dosage.<br> (12 tablets provide +15ug of Biotin (30% Reference Intake).<br> <br> <b>Ingredients:</b><br> Kali Mur (Potassium Chloride)<br> Nat Phos (Sodium Phosphate)<br> Nat Sulph (Sodium Sulphate)<br> <br> <b>Other Ingredients:</b> Lactose <b>(milk)</b>, gum arabic, biotin.<br> <br> <b>Allergy Advice:</b><br> For allergens see ingredients in bold<br> Suitable for vegetarians.<br> <br> <b>Caution:</b><br> Do not exceed the recommended dose.<br> Store in a cool dry place out of the reach and sight of children.<br> You should tip the tablets into the lid of the tub and then straight into your mouth - best if not contaminated by handling.<br> <br> <b>Other Information:</b><br> New Era Biochemic Remedies are prepared from from safe, natural and non-habit forming ingredients. They are based on <b>Dr Schuessler's</b> Nutritional Biochemic System of Medicine.<br> <br> New Era contain <b>Biotin</b> which contributes to the normal energy yielding metabolism, functioning of the nervous system, normal macronutrient metabolism and psychological function. It also contributes to the maintenance of normal hair, skin and to the maintenance of normal mucous membranes. These Health Claims are approved as per the EU Register on Nutrition and Health Claims.<br> <br> <b>Combination Tissue Salt A:</b> Sciatica, nerviness.<br> <b>Combination Tissue Salt B:</b> Nervousness, general debility, convalescence.<br> <b>Combination Tissue Salt C:</b> Acidity, heartburn, dyspepsia.<br> <b>Combination Tissue Salt D:</b> Minor skin ailments.<br> <b>Combination Tissue Salt E:</b> Flatulence, colicky pains, indigestion.<br> <b>Combination Tissue Salt F:</b> Nervous and migraine headaches.<br> <b>Combination Tissue Salt G:</b> Backache, lumbago.<br> <b>Combination Tissue Salt H:</b> Hayfever, allergic rhinitis.<br> <b>Combination Tissue Salt I:</b> Fibrositis, muscular pain<br> <b>Combination Tissue Salt J:</b> Coughs, colds, chestiness.<br> <b>Combination Tissue Salt K:</b> Brittle nails.<br> <b>Combination Tissue Salt L:</b> Varicose Veins and Circulatory Disorders.<br> <b>Combination Tissue Salt M:</b> Rheumatic pain<br> <b>Combination Tissue Salt N:</b> Menstrual Pain.<br> <b>Combination Tissue Salt P:</b> Aching Feet and Legs.<br> <b>Combination Tissue Salt Q:</b> Catarrh, sinus disorders.<br> <b>Combination Tissue Salt R:</b> Teething pains.<br> <b>Combination Tissue Salt S:</b> Stomach upsets, biliousness, sick headache. Children: Up to 12yrs half dosage. (12 tablets provide +15ug of Biotin (30% Reference Intake). Other Ingredients: Lactose (milk), gum arabic, biotin. You should tip the tablets into the lid of the tub and then straight into your mouth - best if not contaminated by handling. New Era Biochemic Remedies are prepared from from safe, natural and non-habit forming ingredients. They are based on Dr Schuessler's Nutritional Biochemic System of Medicine. Combination Tissue Salt A: Sciatica, nerviness. Combination Tissue Salt B: Nervousness, general debility, convalescence. Combination Tissue Salt C: Acidity, heartburn, dyspepsia. Combination Tissue Salt D: Minor skin ailments. Combination Tissue Salt E: Flatulence, colicky pains, indigestion. Combination Tissue Salt F: Nervous and migraine headaches. Combination Tissue Salt G: Backache, lumbago. Combination Tissue Salt H: Hayfever, allergic rhinitis. Combination Tissue Salt J: Coughs, colds, chestiness. Combination Tissue Salt K: Brittle nails. Combination Tissue Salt L: Varicose Veins and Circulatory Disorders. Combination Tissue Salt N: Menstrual Pain. Combination Tissue Salt P: Aching Feet and Legs. Combination Tissue Salt Q: Catarrh, sinus disorders. Combination Tissue Salt R: Teething pains. Combination Tissue Salt S: Stomach upsets, biliousness, sick headache. 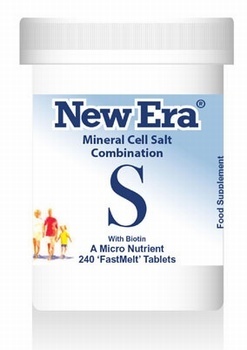 Send Us Your Review of New Era Combination S 240 Tablets - SPECIAL OFFER!